(August 17, 2010 - Markham, ON - For Immediate Release) Today LEAF (Local Enhancement & Appreciation of Forests) officially launched its Do-It-Yourself Backyard Tree Planting Program (www.mybackyardtree.ca) in central and northern York Region. The program is made possible with the support of the Regional Municipality of York, Ontario Power Generation and the Ontario Power Authority. “This subsidized program is open to residents of Aurora, East Gwillimbury, Georgina, King Township, Newmarket, and Whitchurch-Stouffville and will offer professional assistance in choosing native trees and shrubs for residential back yards,” said Janet McKay, founder and Executive Director of LEAF. Planting trees in urban settings provides many benefits including reducing smog, providing shade to escape the summer heat, reducing the need for air conditioning and supporting a healthy environment by providing food and shelter for birds and butterflies. In addition, residents can see an increase in their property value as treed neighbourhoods and lots are much more desirable. 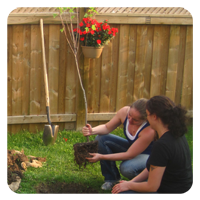 The Do-It-Yourself Backyard Tree Planting Program is an alternative model that will complement LEAF’s Full Service Backyard Tree Planting Program, which has been offered in southern York Region municipalities (Markham, Vaughan and Richmond Hill) since 2008. In the full service model, LEAF staff visit each household to do an in-person consultation. Through this new, Do-It-Yourself model, LEAF is able to offer education and personalized advice through online videos and interactive tools. That means residents throughout York Region can take advantage of the program while LEAF minimizes its travel and carbon footprint. To get details on the program available in your area visit www.mybackyardtree.ca. Participants can chose smaller trees for pick up and can get their trees on Saturday, September 18th at the East Gwillimbury Farmers Market or on Saturday, September 25th at the Newmarket Farmers Market. Those who choose to purchase larger trees will have them delivered in spring of 2011.